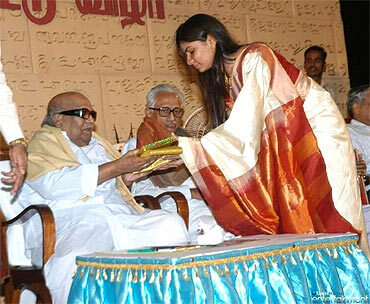 Rediff.com » Movies » Meet Tamil TV's best known multi-tasker! She sings, she dubs, runs a company that offers translation services, hosts mega shows on TV, takes part in music albums and is ready take on anything new. 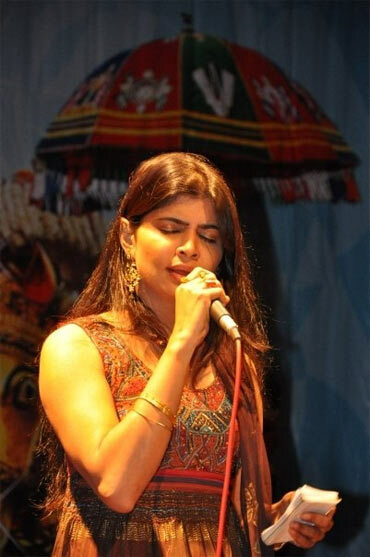 That's Chinmayi Sripada for you, one of Tamil television's best known multi-taskers. She has won a good deal of accolade for her work -- her dubbing for Jessie, from Vinnaithaandi Varuvaya has won rave reviews, while she was also the recipient, recently, of the Vijay TV Award for Best Playback Singer (Female), for the melodious Varayo Varayo, from Adhavan. You are hosting the show Sangeetha Maha Yuddham, on Sun TV. What's it all about? 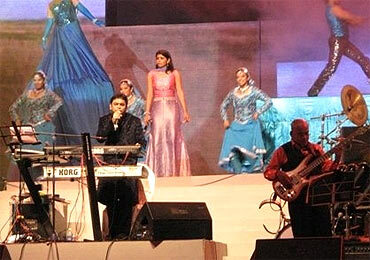 You must have seen the show Music Ka Maha Muqabla on Star Plus. Sangeetha Maha Yuddham is basically the Tamil version of it. The show has six teams, with three members each, and each team has a captain. They're playback singers Vijay Yesudas, Devan Ekambaram, Madhu Balakrishnan, Mathangi, Srilekha Parthasarathy and Anupama. There's a round-robin method, and each episode will see two teams compete against each other. And the captains of the four teams that are not playing, will act as judges. So, basically, the singers become competitors in one episode and judges in another. Eventually, you'll have four teams in the semi-finals and two in the finals. There are three rounds -- you have the Jugalbandhi or Nerukku Ner round, the solo round, where each team sends one of their team mates against the other. Then there's the round where captains participate along with their teams. That depends on the previous rounds, of course, and they can participate at their discretion. The teams are evaluated in each round and marks are awarded, so they don't have to wait until all the rounds are ended, for elimination. I host the whole show -- I take the audience through the rounds, introducing the teams, and so on. And yes, I sing as well. Not competitively, of course, but I sing a sort of welcome song, as each episode begins. I'm having a lot of fun. Do you think the show will entice Tamil audiences? Why not? The show has got everything. Great format, many lead singers whom the audience will have a chance to see and hear. I'm quite certain it will rake in the TRPs. You dub for movies, sing full time, and are an entrepreneur as well. How do you manage to do so many things at the same time? [Laughs] The truth is, I have an excellent team, a staff that handles Blue Elephant, my translation company, perfectly. It is like a well-oiled machine. As for song-recordings -- well, that's something that just happens. I've been working with music directors like Harris Jeyaraj sir, A R Rahman sir, and the experience is great. Yes, I have had to rearrange my schedules, last week we were shooting, and there were song recordings as well. So far, I've been doing well. You were a part of the Chemmozhi Anthem too. What was that experience like? Awesome! Gautam Menon is an excellent director; he has just given Vinnaithaandi Varuvaya, a huge hit, so it was an honour working with him. Of course, I only had a line to sing, but I remember feeling very nervous when we had to shoot for it. All those arc-lights, and people standing around, watching you; it was very unnerving. I was shivering. But it was great shooting with all the other singers, legends like Susheela Amma. We couldn't shoot with A R Rahman sir, though, he was on tour, and he shot separately, the next day. It was wonderful. Catch Sangeetha Maha Yuddham on weekends at 9.30 pm, on Sun TV.